Today’s guest blogger is Richard Hatch. He holds Masters of Science and Master of Philosophy degrees in Physics from Yale University. However, deciding he would rather violate the laws of nature than discover them, Hatch has been a professional magician full time since 1983. 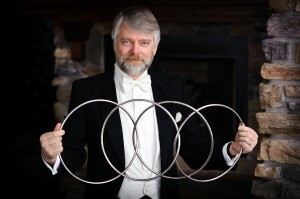 He is co-founder of the Hatch Academy of Magic and Music in Logan, Utah. Richard Hatch is returning to HMNS July 31 – August 2 as an encore to his popular sold-out classes offered last summer. This time we are offering Magic 301, in addition to Magic 101 and 201. 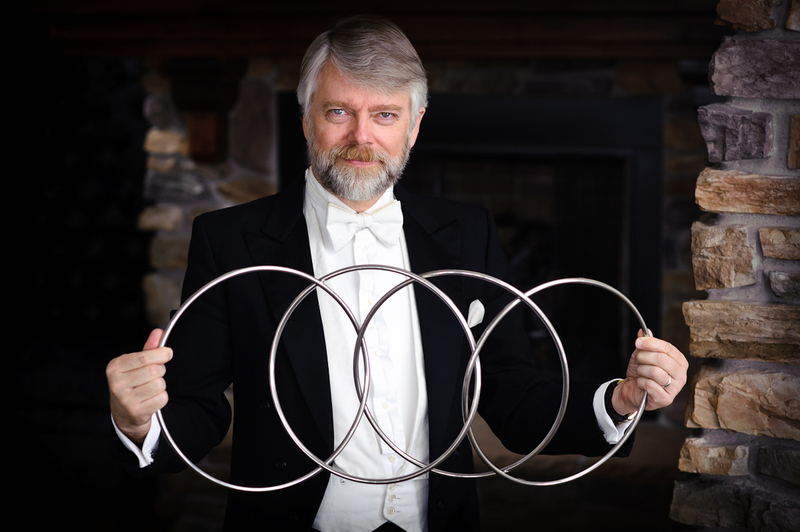 If you want to be armed with tricks up your sleeve, don’t miss these classes by magician Richard Hatch. All students are expected to adhere to the magicians’ code of secrecy regarding the techniques taught. Click here for more information on the Magic Classes and to register. The fantastic Magic! exhibit that ran at HMNS from February 26 through September 26 last year was my first experience working with a museum. Guest curator Scott Cervine, himself an award-winning magician and a filmmaker, did a great job rounding up and organizing artifacts and performers and working with the museum staff to present them in a truly wonderful way. It was a singular honor to be associated with this exhibit, both as a lender of artifacts, consultant, lecturer on magic history at the associated extension course at Rice University’s Glasscock School of Continuing Studies, performer (both close up and on the special stage built for this event) and designer and teacher of the adult magic classes (Magic 101 and Magic 201). In the latter role, I particularly enjoyed the feedback from students and used it to tweak the classes over the course of the exhibit, leaving out things that took too much class time to explain properly, adding others based on student feedback about what they enjoyed. These monthly classes were a highlight of my participation in the exhibit and inspired me to open a school of magic (and music) in my hometown Logan, Utah, where I moved just a few weeks after the exhibit ended with my wife, violinist Rosemary Kimura Hatch. Our concern with leaving Houston was how we would keep busy professionally in a new community where we were totally unknown. Rosemary gave up a large studio of violin students in Houston in order to make the move, so it was logical for us to think that she could, over time, find students in our new home, a small college town in northern Utah. I thought that by offering magic classes in addition to Rosemary’s music classes, it would help draw media attention to our new venture. My press releases characterized our venture, the Hatch Academy of Magic and Music, as a “combination of Hogwarts and Julliard” and the local media was intrigued enough to feature us in numerous articles and in radio interviews leading up to the official opening of our school last January. As a direct result of my participation in the HMNS exhibit, I was hired to perform and teach magic classes at the Discovery Science Place in Tyler, Texas at the end of January. Earlier that month I traveled to Los Angeles to lecture docents of the Skirball Cultural Center in preparation for their exhibit, “Masters of Illusion: Jewish Magicians of the Golden Age” which opened in late April. Just prior to the official opening of the exhibit, I returned to the Skirball Museum to lead media tours. This wonderful exhibit runs through September 4th and focuses on the remarkable contributions of Jewish magicians to the art. At the Hatch Academy of Magic and Music I offer both group lessons and private lessons. This summer I have added a class called “How to be an Amazing Grandparent” to introduce magic to a more mature demographic. Rosemary and I also started offering monthly performances of magic and music, along with our son, pianist Jonathan Hatch. We are calling these performances “Matinées Enchantées” as a small homage to the great Robert-Houdin (1805 – 1871) whose performances in Paris in the 1840s revolutionized the art of magic and were called “Soirées Fantastiques” (we give our performances in the afternoon, rather than the evening). The venue only seats 56 and the April, May and June performances have all sold out in advance. Rosemary is teaching at Interlochen, Michigan the entire month of July, so we won’t start these up again until August. In the meantime, we are exploring venues for touring with this performance, which is suitable for small theaters with good acoustics and a tuned piano. We particularly enjoy performing in historic opera houses (such as the Columbus Opera House, in Columbus, Texas, where we performed many years ago). I’m looking forward to returning to the Houston Museum of Natural Science for the upcoming Magic 101, Magic 102, and Magic 103 classes starting July 31. Each class is independent and there are no prerequisites. All students are required to sign a non-disclosure agreement regarding the secrets of magic (the traditional “magicians’ oath”) and we spend the first few minutes of the class explaining why this is important. Contrary to popular opinion, the secrecy oath is not to protect the secrets of magic, but to protect audiences from those secrets! In addition to the magic learned in class, resources are shared for continuing to learn magic outside the classroom environment. This is wonderful! I look forward to seeing Mr. Hatch again. Previous Post VIDEO: Our New Corpse Flower. Help Us Name Her! Next Post Name Our New Corpse Flower! A Sneak Peak At Our Upcoming Members Spring Sip and Shop Event!